When planning for retirement, most people plan on their savings lasting about 20 years, which is the length of the average retirement. But if you’re planning on your finances lasting longer than that, you need to understand the rules for the required minimum distribution (RMD) on your individual retirement accounts. If you’re on a slow pace when it comes to withdrawing your retirement funds, you should know that the IRS sets a minimum percentage you’re required to take out of most types of retirement accounts when you hit a certain age. Here’s everything you need to know about the RMD. 1. Why does the government have required minimum distributions? The government has RMDs on individual retirement accounts (IRAs) to make sure they get their share. These rules are in place to ensure that investors don’t build up a sizable tax-free retirement fund and then leave it as an inheritance to their children or other family members. Doing this would allow heirs to avoid paying the inheritance tax. At a certain point, retirees have to take out a particular portion of their funds every single year. 2. At what age does the required minimum distribution take effect? The required minimum distribution takes effect when you turn 70 ½, defined by the IRS as six months from the day you turn 70. RMDs begin during that calendar year even if you hit the 70 ½ mark on December 31 of the current year. 3. What type of account does the required minimum distribution apply to? Since you fund a Roth IRA with money, you have paid income taxes on, this type of account is not affected by an RMD. 4. Are there any exceptions to required minimum distribution rules? Like almost any rule, there are indeed some exceptions when it comes to RMDs. Like almost anything involving the IRS, it can be a bit complex. If someone is still working after the age of 70 ½, is still participating in a 401(k), does not own more than 5 percent of the company they work for, and their plan doesn’t mandate a payout at 70 ½, then the RMD rule doesn’t apply. If a worker under those conditions rolls over an IRA or another 401(k) into that plan, those assets are typically be protected under the same rule as well. 5. How much are required minimum distributions? 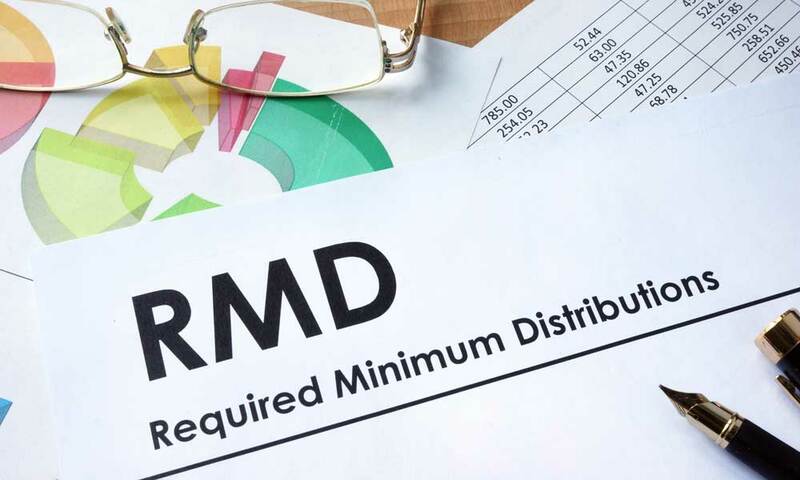 The IRS offers a worksheet to determine what your RMDs are, but as a general rule, minimum distributions start at around 3.6 percent and rise with age. It’s important to note that an RMD will never be enough to empty an account. For people who have multiple IRA accounts, they must calculate all of their accounts separately but can withdraw the required total amount from a single account. For 401(k) accounts, the RMD must be taken out of each account individually. An RMD amount is based on your IRA balance at the end of the previous year. For example, your 2018 RMD is determined by the balance in your IRA account on Dec. 31, 2017. Since an RMD is just what the name says – a minimum – an overpayment of an RMD one year cannot be applied to a future year. 6. When are required minimum distributions taken out? It’s important to remember that taking out an RMD is up to the account holder. While the IRA provider may send a notice, the IRS will not contact you to state how much should be taken out. The deadline to take an RMD is December 31st of every year, except for your very first RMD, which can be taken until April 1st of the calendar year after you turn 70 ½. But remember if you do that, you will be taking two RMDs in the same year. 7. Do required minimum distributions have to be taken in cash? RMDs are not required to be taken in cash, something that’s good news especially for people with a self-directed IRA. An RMD can be taken out as what’s called “in kind” or, as stocks, real estate, or some other investment. This rule is an essential point for account holders who don’t plan to spend their retirement money. 8. What if someone doesn’t take a required minimum distribution? RMD rules are designed to make sure the IRS gets their taxes on your investment, and as such, they have heavy penalties in place for people who don’t follow the rules. Anyone who doesn’t take an RMD is required to fill out a Form 5329 (the Additional Taxes on Qualified Plans Including IRAs and Other Tax-Favored Accounts form) and pay a 50 percent tax on the amount they were supposed to take. But this IRS rule has another exception. If you can prove that you didn’t take an RMD because of a reasonable error and that you’re making a reasonable effort to fix the problem, the penalty for not taking the full amount might be waived. You’ll still need to fill out a Form 5329 and attach a letter of explanation though. 9. How are required minimum distributions taxed? Since you’re just withdrawing from your IRA account, an RMD is taxed just like normal income, based on your bracket at the time. And depending on your state, those income taxes may apply as well. The required minimum distribution is something that a lot of people aren’t aware of, and with good reason – it’s a rule that won’t affect them. Most people are likely taking out more than the required amount anyway, especially those following the common-used 4 percent retirement rule. But for those purposely holding off on withdrawing their money, it’s important to be aware of RMD rules. If you don’t withdraw your money as required, you will have to pay extra tax penalties. 6 Tips For Financial Stability In Retirement How Much Money Do I Need to Retire? What Is A Roth IRA? What is a 401(k) Retirement Plan?